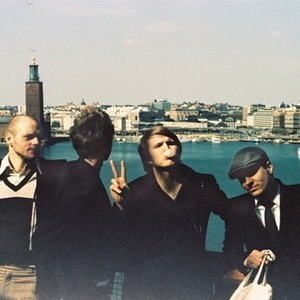 Laakso is a Swedish pop group with Finnish influences, vocal harmony and a harmonic guitar-work. The band consists of Markus Kruneg&aring;rd, Lars Skoglund, David Nyg?rd and Mikael Fritz. In the fall of 1999 at a lunch canteen of the university outside of Uppsala, Sweden, Markus was humming to a Belle & Sebastian song so that David could hear him. It was enough to convince that the chasm between an indie-nerd who didn't care enough and a vegan who wanted only to demonstrate could in fact be bridged. Later they moved in together and formed LAAKSO. In the fall of 1999 at a lunch canteen of the university outside of Uppsala, Sweden, Markus was humming to a Belle & Sebastian song so that David could hear him. It was enough to convince that the chasm between an indie-nerd who didn't care enough and a vegan who wanted only to demonstrate could in fact be bridged. Later they moved in together and formed LAAKSO. The name LAAKSO and the fact that the band exclusively sang in Finnish when they first formed is due to David's both parents and Markus' mother all coming from Tornedalen (Tornionjokilaakso, Laakso meaning valley). After resolutely searching amongst the students of Uppsala they found Micke, a dungeons and dragons fanatic from Gotland (an island on the East coast of Sweden) who liked Guns & Roses and loved to play bass; and Jonathan, the drummer. Jonathan developed stage fight and was replaced a few days before the recording of their debut EP - Long beach EP - by Lars, a carefree lad with passion for funk. Things developed at a steady pace and LAAKSO made new friends. David and The Citizens and The Concretes were probably the most meaningful meetings. The first indirectly lead to a recording contract with a small independent Adrian Recordings and Luger to become their booking agency. The second meeting lead to a love affair between Laakso and producer Jari Haapalainen (Ed Harcourt, Moneybrother, Kristofer &Aring;str&ouml;m, The Concretes and Nicolai Dunger). Since then Jari had accompanied guys into the studio for all their recordings - from Long beach EP via LAAKSO's debut album I Miss You, Im Pregnant and a single Aussie Girl to their second release My Gods and finally to an album Mother, Am I Good Looking?.